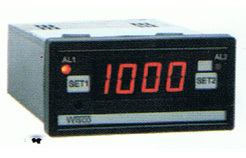 Adjustable LCD Digital Panel Meter offers a 3-1/2 digit display for easy viewing in a standard 1/8 DIN package. Unit accepts 4 to 20 mA, 0 to 5 VDC, or 0 to 10 VDC inputs with a wide bipolar span and zero adjustment. Standard features include field selectable engineering units and decimal point positions. Choose from red, amber, or green segments for easy viewing at a distance. A 24 VDC power supply is required for the operation of the backlight. Used to display process values from pressure, humidity, temperature, voltage, current, watt, or power factor transmitters.